In Thailand, at least 21 have been killed and dozens are missing after flash floods swept across the south of the country. 120 were rescued from the water and surrounding rocks. People struck the rural area near the Bantad mountain range as many Thais flocked to the countryside to celebrate their traditional New Year holiday. Heavy rains lasting for three days are believed to have triggered the floods, in which two waterfalls burst their banks. An estimated 200 people were in the affected area. 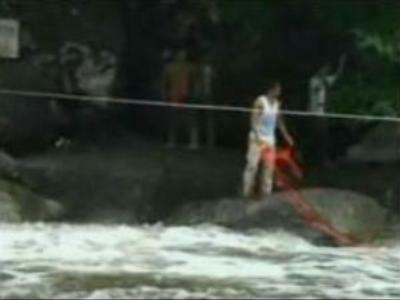 120 were rescued from the water and surrounding rocks.